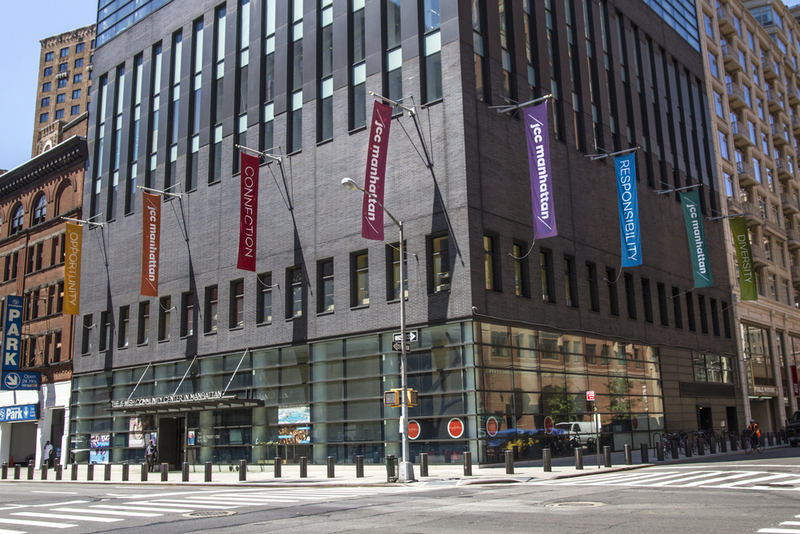 Our school was founded in September 2001 as the Marlene Meyerson JCC Manhattan's building opened for the first time. Since then, our school has grown—both larger and stronger—but has remained true to its roots. We started as a progressive Jewish nursery school committed to building a strong foundation for community life, and, proudly, we still are today. Tara Ekelman, admissions director and school administrator, and Linda Sierra, administrative receptionist, both began their journey with the nursery school early on and remain the smiling faces welcoming children and families to our school today. Over the years, our school has been shaped by our participation in many different exciting educational opportunities. Starting in 2006, a number of educational coaches have significantly impacted our teachers to deliver a Reggio-inspired, meaningful, emergent, play-based curriculum. This work continues in our school to this day, and owes its roots to those wonderful coaches who helped us get started. For several years, our school sent two teachers to the town of Reggio Emilia, Italy, to immerse themselves in high-quality early childhood education and return to share their learnings with our staff. We continue to be inspired and challenged by this approach to education. In 2010, our school became an accredited member of the Jewish Early Childhood Education Initiative (JECEI), having met its high standards for quality. The accreditation process with JECEI helped our teachers establish our own unique set of core Jewish values that permeates all that we do. These values remain at the center of who we are. Two doctors of education worked with our teachers in 2012 to explore constructivist pedagogy (an approach in which children collaboratively construct knowledge) and its intersection with Jewish holiday curricula. This work helped our teachers develop their own innovative approach to building meaningful holiday experiences in our school, as well as provide the researchers with a deeper understanding of their research topic. Winter 2012 saw our school facilitate a regional conference for JCC early childhood educators. Our teaching staff developed numerous workshops on various Reggio-inspired topics, such as emergent curriculum, daily reflections, open-ended materials, and the value of creative play. Dozens of educators were enriched by the experience and left inspired to experiment with some of our practices at their own schools. After the conclusion of the 2012-2013 school year, long-time school director Ilana Ruskay-Kidd departed the school to serve as the visionary founder of Shefa, the first pluralistic Jewish day school for children with learning disabilities. Noah Mencow Hichenberg became the school’s director in summer 2013, after having taught for five years in our program for three-year-olds and serving on the school’s Leadership Team. Beginning in 2013, our school debuted an approach to professional development for teachers that relies on peer observation and feedback termed the Peer Learning Cycle. This approach takes two gleanings from a wealth of research on teachers and puts them at the center of our professional development: teachers learn and grow when they deprivatize their practice; and, when doing so, teachers generate meaningful knowledge about their craft. The Peer Learning Cycle shifts each year in response to the dynamic growth and goals of our teaching staff, yet remains true to this core. You can learn more about the Peer Learning Cycle in this piece in the Parents League Review, written by our school director and a former teacher. Our school was happy to host the 2013 unveiling of the United States Postal Service Hanukkah stamp, which included a ceremony by the USPS that ended with a rousing rendition of Hanukkah songs performed by our very own nursery students. Shari Pick-Taishoff, associate director, joined our school in summer 2014. Shari taught nursery school for several years in private Jewish synagogue and communal settings, and more recently served as assistant director of a large Jewish nursery, afterschool, and camp program. During the school year 2014-2015, our teachers participated in a lengthy series of conferences and workshops on Reggio-inspired practices here in New York City. Our teachers attended keynote speeches by leading educators from the town of Reggio Emilia, learned with our Reggio-inspired educators, and attended a world-renowned museum exhibit curated by Reggio educators. Notably, our teachers also facilitated some of these workshops, giving them an opportunity to showcase the ideas, curricula, and teaching practices we have developed right here at the Marlene Meyerson JCC Manhattan. One highlight of the year was when one of our teachers received the Vivian Gussin Paley Award for Excellence in Early Childhood Teaching. Our school has also benefited from a very close and ongoing relationship with the vice president of early childhood education and family engagement of the JCC Association of North America. Mark Horowitz has provided our staff with countless occasions of deep Jewish learning and stimulating discussions about educational practices. Summer 2016 saw the Marlene Meyerson JCC Manhattan host the first annual Come Learn With Us conference for educators from throughout the tristate area (and beyond). We welcomed over 100 educators into our school for a two-day conference dedicated to progressive ideas about working with young children. Topics included socio-constructivist learning, creative use of materials, Jewish texts informing classroom community, Reggio Emilia philosophy, and gender in the nursery years. Each workshop was led by a different presenter who has, in his or her own way, helped shape our school community. The conference was an opportunity to share those who have inspired us over the years with the broader nursery community.